“Come at the king, you best not miss.” That’s what Omar said, and it applies in scenarios like this one. The king is the BMW 3 Series, the midsize sport sedan everyone buys. And these days it has more challengers coming at it than ever. 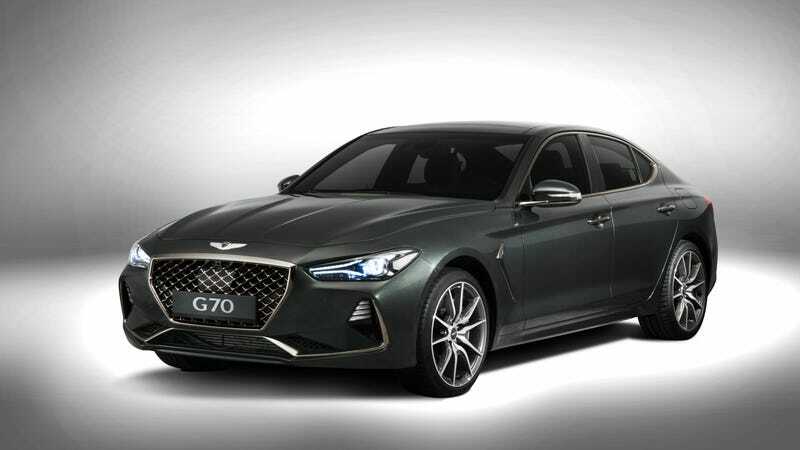 Meet the latest and most different one yet: the 2018 Genesis G70, the first compact sport sedan from Hyundai’s luxury brand. Right off the bat I’ll say this: it looks sharp. More so than I expected. Granted, it’s a bit indistinctive—the total package reminds me of the Infiniti Q50 and the Alfa Romeo Giulia, two cars it’ll no doubt compete against—but you can’t deny it’s a handsome, aggressive, elegant design. They did good here. But looks will only get you so far! You can have three things under the hood (just not all at once, obviously): a 2.0-liter turbo four, a 3.3-liter turbo V6, and a 2.2-liter turbodiesel four. America is not getting that last one, Automotive News says, because of course we won’t. But a coupe is expected! That’s nice. The top model has 365 horsepower, which tops even the BMW 340i. The gas four-cylinder offers 250 HP. It’s available in rear- or all-wheel drive, as these things tend to be. Other goodies include launch control, torque vectoring and an available mechanical limited slip differential. The G70 will need all those things and more to get really taken seriously in the marketplace. Hyundai and its brands have done amazing things in the past few years, but performance is still an area where they’re seriously lagging. The company’s offerings just aren’t up to par in terms of handling, especially, and outright speed. On the inside, it’s definitely aimed at BMW—check that control knob and screen combo. I’ll wait to judge it in person, but it looks elegant, and at least something of a step up from nicer Hyundais I’ve driven. But this is a great move in the right direction, and wrapped in a package that’s handsome and refreshing. We’ll see if it can lure luxury buyers away from the Europeans. The price tag hasn’t been announced yet, but I have a feeling it could help in that department.